When was the last time you saw fruit for $.69 a pound? Yeah, I can't remember either, so when I drove past a fruit stand the other day with a sign that read "Pears $.69/pound" I had to stop. I had planned to make most of the pears into jelly or pear butter, but I had some buttermilk and lots of old bread to use up, so I decided to make a bread pudding as well. And of course I'll share the recipe with you! 1. Cut up the bread into cubes and place in an oven set to 200º. This will dry the bread out so it doesn't fall apart when soaked in eggs. Alternatively, you can cut it up and leave it to dry for a couple days. 2. Whisk together the buttermilk, sugar, brandy/mead, vanilla, honey, spices, and eggs in a large bowl. 3. Add in the dry bread and mix until completely coated. Place in the fridge and let sit for up to 2 hours. 4. Chop up the pear into small chunks, reserving 2 or 3 slices if you want to decorate the top of your pudding like I did. 5. 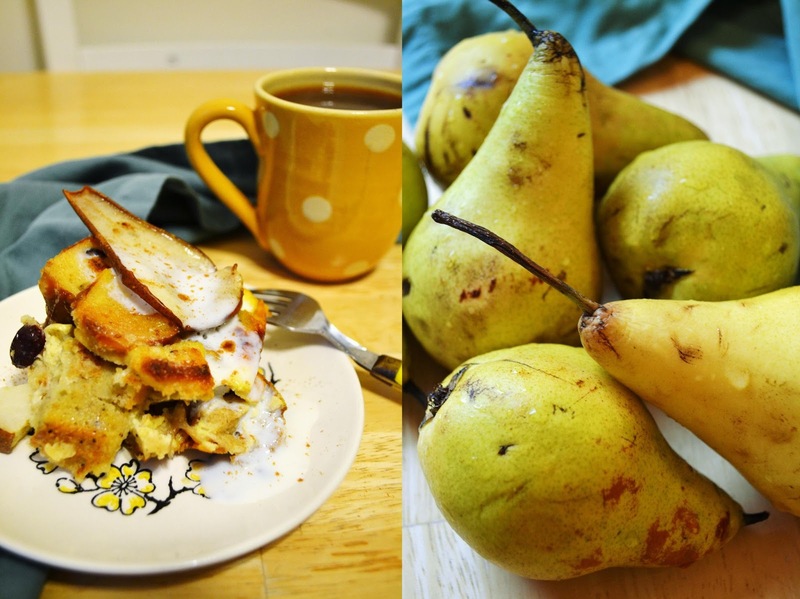 When the bread has soaked for an hour or two, mix in the chopped pears and cranberries. 6. Heat the oven to 375º and thoroughly grease a baking dish. 7. Pour the bread mixture into the baking dish and place in the oven. Cook for 25 minutes. 8. When the timer goes off, remove the pudding from the oven, but don't turn the heat off just yet! At this point you're going to butter the top of the pudding and sprinkle with a bit of sugar. Put back in the oven for another 25 or 30 minutes. 9. When the timer goes off, cut into the middle of the pudding to make sure it's cooked all the way. There may be a little liquid from the pears, but this will be clear-ish. If it still looks too gooey, put it back in, but make sure it doesn't burn! 10. Serve with buttermilk and a sprinkling of cinnamon.